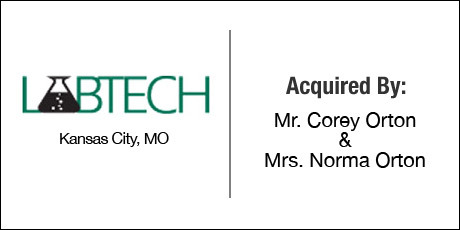 The Buyer: Corey and Norma Orton sought to go into business together after separate corporate careers. Though living in the area of Des Moines, Iowa, at the time, the Ortons expressed a willingness to relocate for the right opportunity. The Seller: Labtech is a premiere staffing company that specializes in the placement of both temporary and full time scientific professionals for the food and beverage, clinical, pharmaceutical, and medical industries. The owner, Ms. Heather Norris, had operated the company for 12 years, and initially contacted DVS to assist her in acquiring a second company. In the course of her search, she decided to sell Labtech in order to create more liquidity for her other acquisition while also removing the distraction of running 2 companies at once. The Close: Labtech had clients in food business so Norma’s career with Wells Enterprises, owner of Blue Bunny Ice Cream and other brands, was meaningful despite her (and Corey’s) lack of experience in staffing. Norma led the acquisition and DVS ensured that Heather assisted with transition of ownership for a year. DVS also provided assistance with the financial structure of the transaction to provide the desired liquidity to Heather for her other pursuits.